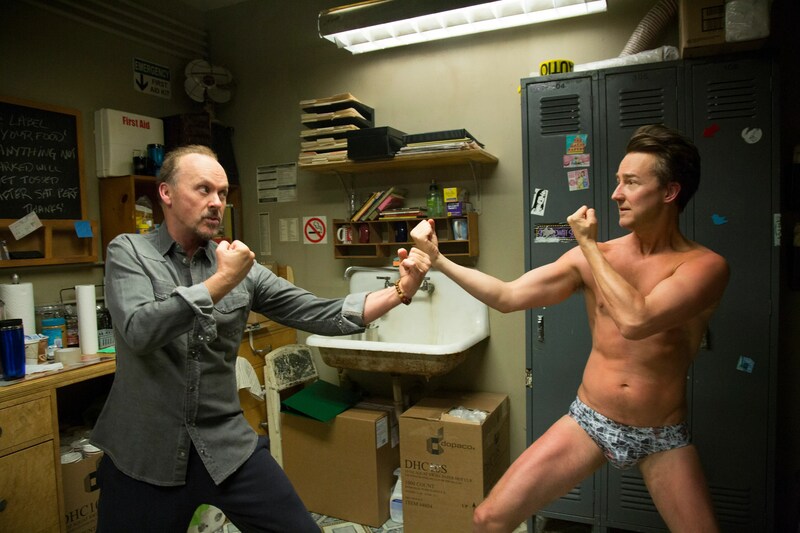 Race to the Oscars: Birdman Is Skies Above The Rest – When Things Go Pop! Every Oscar contender that I’ve seen so far in my “Race to the Oscars” series has owed much of its success to the excellent performance of its leading actor. The Imitation Game had the steely sensitivity of Benedict Cumberbatch, The Theory of Everything had Eddie Redmayne’s staggering physical commitment, and Foxcatcher had Steve Carrell’s chilling transformation. Their performances were extraordinary, so much so that they compensated for the straightforwardness and lack of imagination of their film’s plots. I was expecting more of the same from the next contender in my queue, Birdman. Much of my knowledge of the film was in deference to Michael Keaton’s comeback performance. His frontrunner contention in the Best Actor race, cemented by a Golden Globe win two weeks ago, overshadowed the rest of the film’s acclaim. That was until it scored a leading nine Oscar nominations, tying The Grand Budapest Hotel. Suddenly, Birdman became the film that could run away with more statues than any other film this year. All of the nominations, including Best Picture, are well deserved. Birdman is the first film I’ve seen this season that feels worthy of winning the big award. It’s also the first nominee I’ve seen that works on all levels, much more than an acting showcase for Michael Keaton. For starters, Birdman is crazy creative, employing unusual and dazzling techniques that compliment the psychological chaos of Keaton’s Riggan Thomson, a has-been superhero actor desperate to reinvent himself into a Broadway-ready thespian. The film covers the preview and debut performances of Thomson’s play, his manic interactions with his fellow actors, his lawyer, his family, and the public, all in one long continuous take. Writing this off as a Oscar bait gimmick is easy, but undermines the brilliance in its execution. Birdman is a two-hour long existential nervous breakdown that never loses its momentum or perspective, thanks to director Alejandro Iñárritu’s commitment to his framing device. With masterful cinematography, editing, and visual effects, Iñárritu never disrupts the audience’s access to Thomson’s increasingly fraught world, offering up a unique stream of unraveling consciousness that is utterly engrossing. If the film was all technical wizardry, it would be great, but there is also a gangbusters cast and an excellent script to consider. Michael Keaton gives the performance of a lifetime, imbuing Riggan Thomson with frantic energy, fragility, and a genuine appreciation for the absurd that makes him ridiculous, sympathetic, and a disturbing joy to watch. Just when you think Keaton has maxed out the role’s potential, he pulls back another layer that will surprise you. It’s more than a comeback, it’s a complete redefinition of a career. The entire cast is excellent, but particular notice should be given to Edward Norton and Emma Stone. Norton is a commanding delight on screen, and his scenes with Keaton are an electrifying exhibition of some of the best on-screen chemistry I’ve ever seen. Emma Stone, playing Thomson’s daughter Sam, is surprising as a recovering addict who takes down her father in a searing rebuke of his disingenuous and narcissistic need for relevance in a world he doesn’t understand. It’s a jaw-dropping moment that also highlights just how meta this film is. Besides the casting of Keaton as a fictionalized version of himself, Birdman is incredibly self-aware, offering stinging critiques of everything from social media to the self-seriousness of New York theater. It’s a triumph that such commentary could be made without losing focus of Thomson’s thready world. The film also never loses its adoration for the absurd: ten minutes barely go by before something else completely ridiculous, like an on-stage erection or a half-naked walk through a New York street, happens. Still, it all comes together to inform the character of Riggan Thomson, a man striving for credibility when he exists in a complete absence of reality. It’s an audacious film that shouldn’t work as well as it does, and yet it succeeds in every possible way. Birdman is overwhelmingly deserving of recognition at this year’s Academy Awards. This is, however, a tough year. Best Cinematography should certainly be a lock, even if Emmanuel Lubezki won last year for Gravity. Best Director will be difficult to broach with Richard Linklater as a frontrunner for his groundbreaking work on Boyhood. Michael Keaton is neck-and-neck in the Best Actor category with The Theory of Everything‘s Eddie Redmayne, who matches the level of commitment to his own difficult role, but might be the movie’s best shot at a win. As for Best Picture? Boyhood and Grand Budapest Hotel have been riding a wave of momentum since they both took home Best Picture awards at the Golden Globes that will make a win for Birdman difficult to realize. Of course, anything is possible, so here’s to hoping that Birdman can tap into that on February 25th. Coming up next: Grand Budapest Hotel, Boyhood, and a look at the divide caused by American Sniper. In the meantime, please share your thoughts in the comments! Pingback: Race to the Oscars: Checking Into The Grand Budapest Hotel | When Things Go Pop! Pingback: Chasing Oscar: The Revenant is The Ultimate Leo DiCaprio Showcase | When Things Go Pop! Pingback: Chasing Oscar: Spotlight Casts Child Abuse In The Lead Role | When Things Go Pop! Pingback: Chasing Oscar: The Revenant is The Ultimate Leo DiCaprio Showcase – When Things Go Pop!